I’m so pumped! 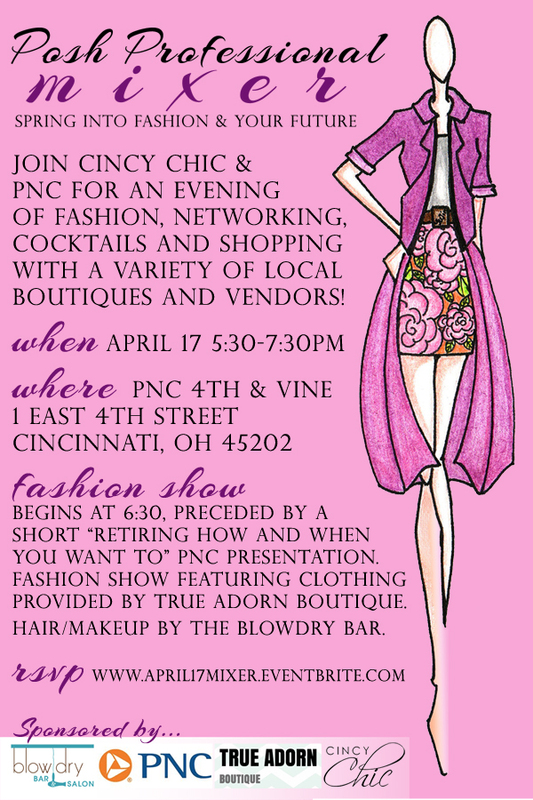 My fab Cincy Chic team and I just posted our first event of 2014!! It’s our “New Year New You” event on Jan 24 at Elements Event & Conference Centre in Sharonville! It’ll feature a runway fashion show featuring the newest trends for the new year, 40+ vendors offering product samples and discounts, as well as primping and pampering stations so you can learn tips and tricks for looking your best in 2014! It’s only $5 to get in and 100% goes to the Patty Brisben Foundation! Check out all the details below and click here to RSVP! Ring in the new year with sipping, shopping and spa-ing! Enjoy complimentary makeup touchups, mini-massages and spa treatments while sipping on Fancy Pants wine and enjoying light bites and sweet treats. Also shop with more than 30 local boutiques and vendors, all with great deals and new trends to get your 2014 off to a stylish start. Don’t miss the runway fashion show at 8pm presented by Harlow & Liv, a new Cincinnati-based online women’s fashion boutique. One lucky attendee will be selected to win a $500 shopping prize pack! Tickets are only $5 and all proceeds benefit the Patty Brisben Foundation. 11th Annual Dress for Success Cincinnati! The 11th Annual Dress for Success Cincinnati Fashion Show & Luncheon is being held on Tuesday, September 18th from 11am-1:30 pm at The Hyatt. Saks Fifth Avenue is hosting the event and its the biggest Cincinnati fashion show that they put on every year. Saks donates the proceeds to Dress for Success Cincinnati from people who show in the store the day of the luncheon- up to $10,000! This year’s title is A Fashionable Affair where they will celebrate the success of more than 14,000 women who have been helped by Dress for Success Cincinnati since it was founded in 1999. The mission of Dress for Success Cincinnati is to promote the success and economic independence of women in need and since its founding has served more than 10,000 women in the Greater Cincinnati community. The event includes a reception and raffle, followed by lunch and the fashion show highlighting styles from Saks Fifth Avenue as well as Dress for Success clients who will share their experiences. Sponsors for the event include Saks Fifth Avenue, Landor, PNC Bank, Always, Keating Muething & Klekamp, Multi Craft, Sibcy Cline, TriHealth, and Wells Fargo Insurance Services. Corporate sponsorships are still available for the event. Tickets for the fashion show and luncheon can be purchased for $75-$150 with table packages available from $750-$1,500.